Some movies fall under the category of “so bad, it’s funny”. 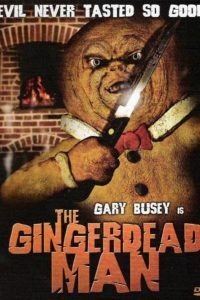 The Gingerdead Man is not one of these movies. I rented this move with the expectation that it wasn’t going to be a cinematic classic. I simply expected a cheesy horror flick with bad acting and special effects that would be good for a laugh. Sadly, it failed to deliver on even these low expectations. The plot of this movie is the fact that a killer’s ashes were mixed into a gingerbread cookie mix by the killer’s mother, and then sent to a bakery; the location of his crimes for which he was caught and executed. It’s a good thing I read the back of the box, because it is the only record of this happening. The movie has cut all scenes involving the mother or the ashes being mixed in with the gingerbread cookie mix. Instead, a cookie simply comes to life with absolutely no attempt at an explanation. There aren’t even any deleted scenes on the DVD to explain why a cookie managed to come to life out of the oven with the soul of a deceased killer. The DVD box is far more entertaining than the actual movie, and does a better job of explaining the plot. I know the box is appealing, and you may be thinking that you can’t go wrong with a cheesy horror flick starring Gary Busey, but Busey’s role is so limited that he adds nothing to this flick.